With winter underway, Central Park’s animals are embracing their cold weather routines — and it’s Sunny Corrao’s job to take notice. Sunny is the Public Engagement Associate for the NYC Parks Wildlife Unit, which teaches New Yorkers — from homeowners to policymakers — how to coexist with the City’s wild animals. “We are the liaison between the New Yorker urban world and the wildlife world,” she says. 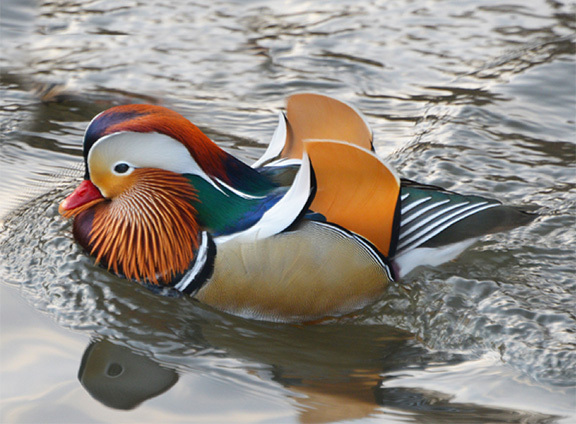 A self-proclaimed “nature nut,” Sunny talked with us about the Park’s diverse wildlife, what to look for this season, and her thoughts on the beloved Mandarin duck. What are some things that visitors may see with the wildlife in the Park this winter? Squirrels create little communities and nest together in the winter. They’re called dreys. 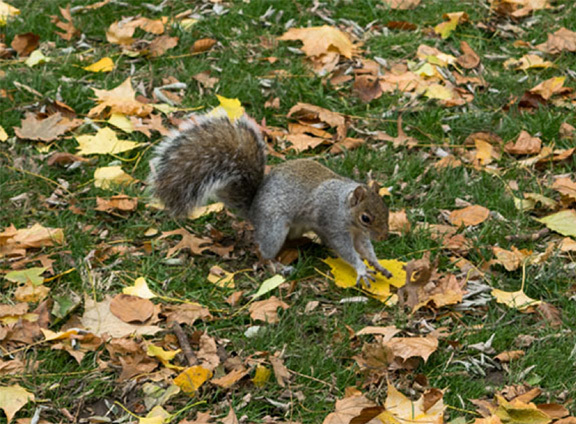 As you walk around the Park, look for big, messy clumps of leaves in the trees — that’s a squirrel drey. They clump leaves together to make their own apartment. You might still see squirrels carrying up leaves — stuffing them in their mouth — and replenishing their dreys. Central Park’s squirrels collect leaves in the chilly weather in order to build their winter nests, which are called dreys. Birds also stick together, but as a safety precaution. We get large groups of grackles together in the wintertime. They are these beautiful blackbirds with a yellow eye ring. I’ve seen 50, 60, 100 birds together flying from tree to tree in Central Park — with more eyes, they can look out for predators. If one sees food, they’ll get down together. Food is scarcer and there’s less tree cover in the winter, so predators have an easier time finding them. If you see a large flock of birds, look at the whole group and see if there are unique birds. Maybe a bird that’s not a grackle decides to take advantage of being part of a large group. It’s cool to see who’s hanging out together. The birds, mammals, and reptiles that call Central Park home — either temporarily or year-round — have adapted to survive the cold. 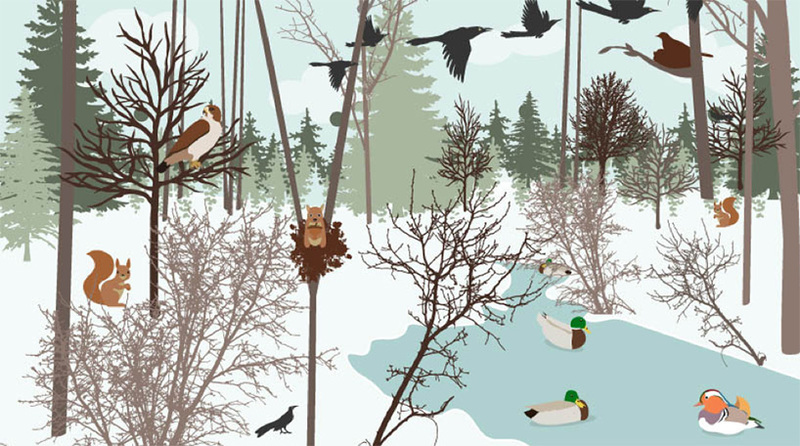 One of the most frequent wildlife questions we get from visitors (also one famously asked by Holden Caulfield in The Catcher in the Rye) is where do the ducks go in the winter? Many fly south, and for some species, New York City is their southern location. Others, like mallards, stay here all year long. All the ducks need is open water to swim. As smaller ponds start to freeze over, they fly to larger lakes or open water. During arctic blasts, look at the piers and coves along the City’s waterfront and you may find ducks swimming in these sheltered areas. Their feathers are basically a down ski jacket — keeping them dry and warm. Their webbed feet are protected by a uniquely designed circulatory system, and the water temperature is usually warmer than the air temperature. During New York City winters, you will find a larger variety of ducks and other waterfowl. Look for groups of northern shovelers, ruddy ducks, buffleheads, and mergansers, which have flown south to the City. 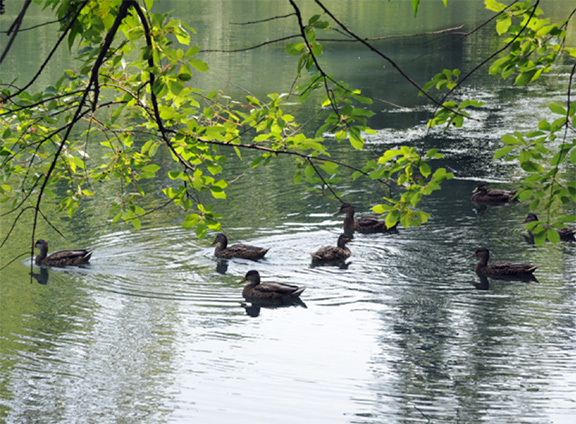 The Harlem Meer is a popular location for ducks throughout the year. When the water starts to ice over, ducks travel south to the Reservoir, where the water’s surface is usually too large to freeze. Speaking of ducks, over the past few months we’ve had a famous one spending some time in the Park. How do you think the Mandarin duck will fare this winter? Wildlife are pretty savvy. Animals that have learned to survive with us have an amazing capacity to adapt, so he deserves all of the attention he’s getting. I think he will fare just fine. As long as he can fly and get around, he can protect himself. The species’ home range in Asia includes areas with a similar climate to New York City. Whether he is from our area locally or he traveled from afar, he should be able to naturally survive the winter. The Mandarin duck first appeared in Central Park in October. It’s a mystery why the duck, native to Asia, has established New York City as his home. How can people help the wildlife in Central Park? Like any New Yorker, wildlife can survive on their own. We’re caring for their habitat, but NYC Parks would step in only if there were an issue or a really sick animal. The Mandarin duck, for instance, and other ducks in the Park don’t need extra assistance from us — so please do not feed them as it can be damaging to their health. Food commonly given to ducks, like bread and corn, are low in necessary nutrients. These handouts end up displacing healthy foods they naturally eat and cause them to become malnourished. Feeding can also promote water pollution and disease in waterfowl populations, and cause animals to become dependent on people for their meals. In the interest of preserving ducks’ overall well-being, it is very important that New Yorkers avoid feeding them. Central Park is great because there’s lots of foliage and plants that bloom at different times. There’s food out there now. If the ponds aren’t frozen, there’s aquatic plants at the bottom for waterfowl. 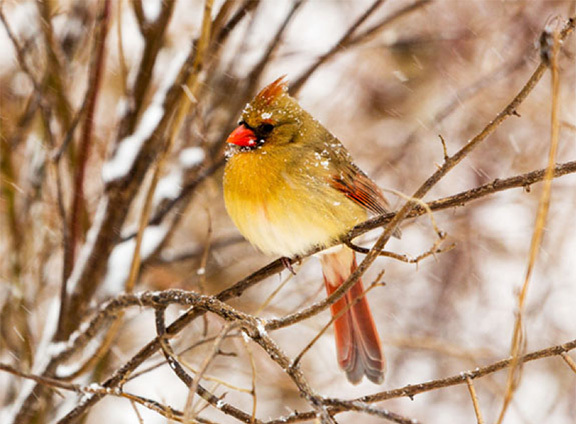 For songbirds, you have late-flowering plants like asters that produce seeds. They’ll be able to eat those throughout the winter. 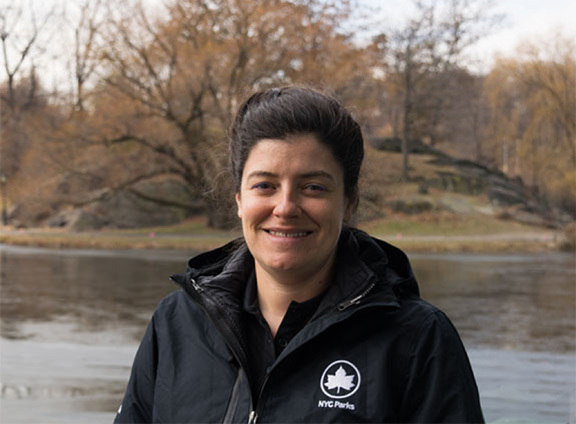 As a member of the Wildlife Unit at NYC Parks, Sunny Corrao helps the public learn more about the animals of New York City. “Animals that have learned to survive with us have an amazing capacity to adapt,” she says. And finally, what are your favorite wildlife moments to witness in Central Park? I love the nesting of red-tailed hawks. You can see when the hawks get a little older, as soon as they get out of the nest, they start branching [beginning to move around on nearby tree branches]. That’s when I compare them to a 2-year-old. They’re really learning. They’re trying to figure out how to fly. They’re stumbling. They’re awkward. They can’t really walk well. So they’re branching around the trees. Watching wildlife figure it out is really cool. I’ve never been able to see that first flight of a hawk — that’s a birdwatcher’s dream. For more information about New York City’s animals, as well as upcoming wildlife-related events and volunteer opportunities, visit WildlifeNYC. A campaign launched by the City of New York, WildlifeNYC aims to increase public awareness about animals in the City. If you spot any healthy wildlife in the City, including Central Park, report your sighting online. Call 311 to report an injured animal.